Poems defy definitions of defiance. They aren’t anything while they’re everything, et cetera. All too often, poets try to control paradox. They try to dress up words in order to present a polished product. They try to correctly play what’s unplayable for a carefully selected audience. Rod Smith has no time for that. He’s too busy doing something altogether different. 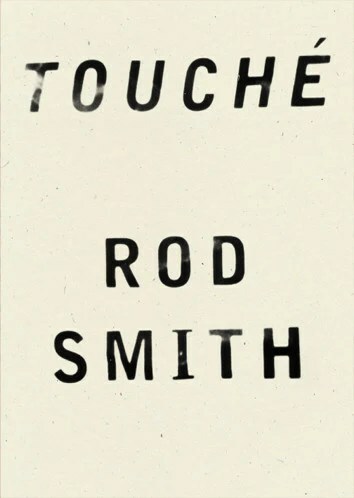 What follows are some of my haphazard reactions to Smith’s latest collection, TOUCHÉ. Before writing this review, I intentionally reread Deed (University of Iowa Press) and some of Robert Creeley’s letters and emails in The Selected Letters of Robert Creeley (University of California Press). TOUCHÉ is a book that’s not a book. These poems are housed in a beautiful book, no doubt, but they came to be by travelling through different conversations, communities, interactions. I could list a dozen or so pieces of evidence that I’ve collected to support this point. Instead, I’ll choose one–”The Good House, etc.” The original long poem, “The Good House,” first appeared as a chapbook that was published by Spectacular Books in 2001. That poem then appeared in Deed. The “addition” to the poem, “The Good House, etc.,” appears in TOUCHÉ and is dedicated to Peter Gizzi. Why is it important for poems to exist or come to an ending or beginning outside the covers of a single book? One possible answer–by living outside a book, a poem is yielding to the nature of poetry, yielding to its paradoxes, its unclassifiable defiance. Place and theory are pieces to the puzzle. It’s far too easy to say that Smith’s book is politically charged, since Smith and his work are inextricably tied to Washington D.C. It’s far too easy to say the book is overly theoretical or abstract, given its subtitle–in memory of my theories vol. 2. Politics is but one of many bases. And theory isn’t the dominant force behind these poems. One of the few places where theory jumped off the page was in “manIFpesto,” when Smith directly quotes Chomsky. The surface clues are much less important than the subsurfaces. The only way into the poems is by carefully perceiving why these poems are explicit and naked. You must pay attention and put in the time. In “The Lyric Republican,” when the reader expects a straightforward political statement, we instead receive, “maybe their worshiping their oaths / has a kind of shaking hook bed index we can flame.” The tone, the message, the experience, the poem is underground. Beneath the surface, Smith’s lines subvert by subverting subversion. Prolonged exposure is revelatory. So, you’re thinking “shaking hook bed index” is simply pure nonsense. You’d be wrong. The non-referential qualities of the poems turn out to be highly referential. These strings of words are nonsensical, but they aren’t pure nonsense. Eventually, the reader starts to pick up the rhythms and forces and ways of Smith’s poetics. Read “frame” for “flame,” or jump across and through any number of words. The reader starts to have expectations and starts to read contextually and across poems and between styles. The reader starts to read many words in one word. The reader begins to read the multiplicities and duplicities of language in “mine is the unmunched cointelpro-pop of cointelpro-pops.” It’s funny how scary language can be. Eventually, the reader is reading in spite of the words. (cointelpro is an acronym for a shady FBI counterintelligence program). John Most is a poet. His latest book of poems is What Thoughts. He lives in Crozet, Virginia.